Microsoft is saying sorry to an entire West Virginia town after suspending a gamer who registered for Xbox Live with an address from Fort Gay. 26-year-old Josh Moore was recently suspended from Xbox Live, not for cheating, hacking or inappropriate behavior, but simply because of his address. He lives in Fort Gay, West Virginia, a real if somewhat unfortunately-named town of about 800, but after entering his address into his user profile, he found himself cut off and confronted by a customer service department that refused to take his explanations seriously. "At first I thought, 'Wow, somebody's thinking I live in the gayest town in West Virginia or something.' I was mad... It makes me feel like they hate gay people," he said. "I'm not even gay, and it makes me feel like they were discriminating." "I figured, I'll explain to them, 'Look in my account. 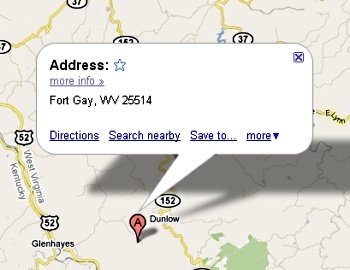 Fort Gay is a real place'," he continued. But the customer service rep he contacted wouldn't even Google the zip code and warned him that if he persisted with the Fort Gay story, his account would be canceled outright and he'd lose his membership fee, which was paid up two years in advance. It eventually reached the point that the town's mayor, David Thompson, got involved, although he didn't fare any better, being told that the word "gay" wasn't appropriate under any circumstances. That's not actually Microsoft's policy, according to Stephen Toulouse, the director of policy and enforcement for Xbox Live. "Someone took the phrase 'fort gay WV' and believed that the individual who had that was trying to offend, or trying to use it in a pejorative manner," he explained. "Unfortunately, one of my people agreed with that. ... When it was brought to my attention, we did revoke the suspension." Toulouse claimed that mistakes like this are rare and said that Microsoft's training programs would be updated to help ensure that it doesn't happen again. He also intends to contact Moore and issue a direct apology. "In this very, very specific case, a mistake was made," he said, "and we're going to make it right."